Here is an update from trip leader Jackie Donnelly of the field trip this past weekend on May 18th at Skidmore Woods in Saratoga. If you couldn’t make it this past weekend – there are still lots of great trips coming up! We had a fine turnout of 10 folks on this perfect spring morning, including two who had come from as far away as Rhode Island and Connecticut . This speaks to the remarkable quality of the Skidmore Woods habitat, located on a geological fault that not only created the springs for which Saratoga Springs is famous, but also contributed the limestone substrate that underlies this rich woods. We explored some of the fault-line boulders to search for such unusual plants as Walking Fern and Maidenhair Spleenwort, before undertaking a loop trail that led us past such rarities as Goldenseal and Green Violet. 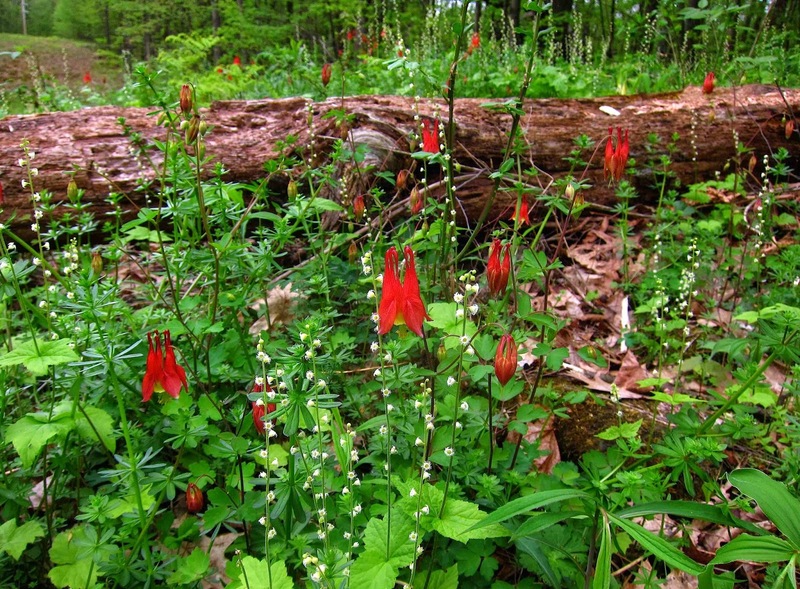 Wild columbine and miterwort at Skidmore Woods. photo by Jackie Donnelly. Although the first flush of spring ephemerals had faded, we could still examine the interesting fruits of such plants as Bloodroot and Large-flowered Bellwort, and witness the changing color of Large-flowered White Trillium from snowy white to pretty pink. 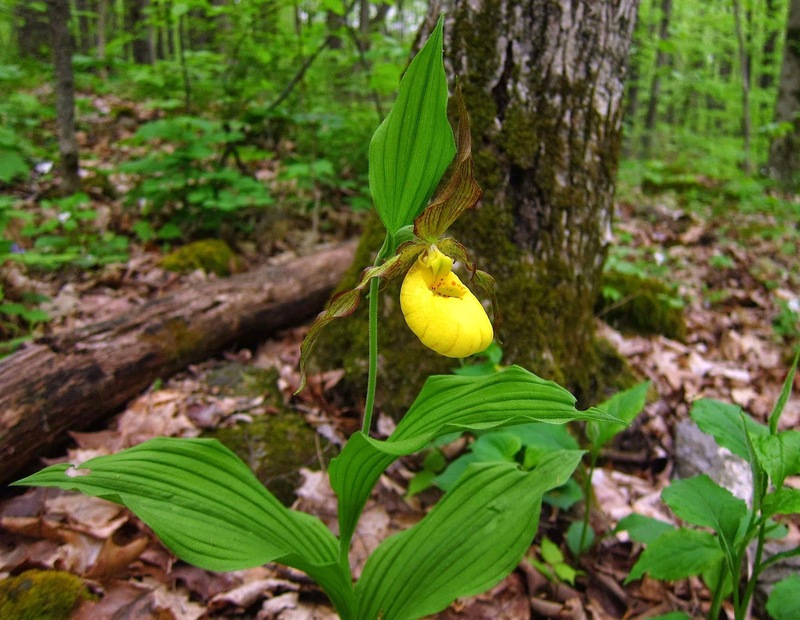 Probably the stars of our walk were the beautiful single specimen of Yellow Lady’s Slipper that shone like a beacon from the base of a tree, and a bright wash of dozens of scarlet Wild Columbines sharing their site with a mass of dainty spikes of Miterwort. Regretfully, when I lead a walk, I usually neglect to take photographs. That’s why I’m glad I posted a preview of this Skidmore walk on my blog Saratoga Woods and Waterways, a post that features many of the beautiful flowers we found on our tour. This post can be seen by clicking HERE.